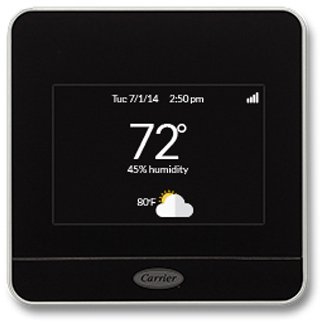 If you are looking to equip your smart home with a high-tech thermostat, here is one you could consider: Carrier has announced that its Côr thermostat is compatible with Apple’s HomeKit. But don’t rush into stores just yet; the HomeKit enabled Carrier Côr thermostat will be available “early” 2017. At the centre of the smart home Apple’s HomeKit enables is the mobile device – iPhone, iPad or Apple Watch – and with the Carrier Côr thermostat now part of it, this means you will be able to use Siri or the Home app to have the heating or air conditioning activated at a certain temperature when you arrive home, or automatically set the system for a more efficient level when you leave home. The Côr thermostat was launched in 2015 at CES and has been compatible with the vast majority of home-comfort systems. It promises to save you hundreds of dollars a year and ultimately to reduce energy consumption and carbon footprint. Although the pricing wasn’t disclosed in the press release issued this week, you can get a Côr thermostat from Amazon Canada for $412.38. If you don’t want to wait until Carrier launches the HomeKit-compatible Côr thermostat, you can get one from the Apple Store – Honeywell Lyric T5 – for $159.95.